�Readers with an interest in the butterflies of Cyprus may well be aware that I have published distribution maps, based on UTM 10 km squares (John, E. 2000. 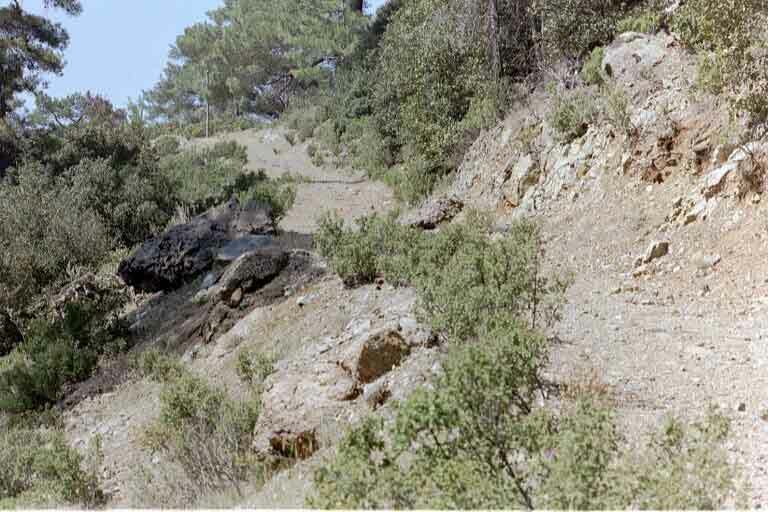 Butterflies of Cyprus 1998 [Records of a year�s sightings] Bull. amat. Ent. Soc., Pamphlet No.15:46 pp.). 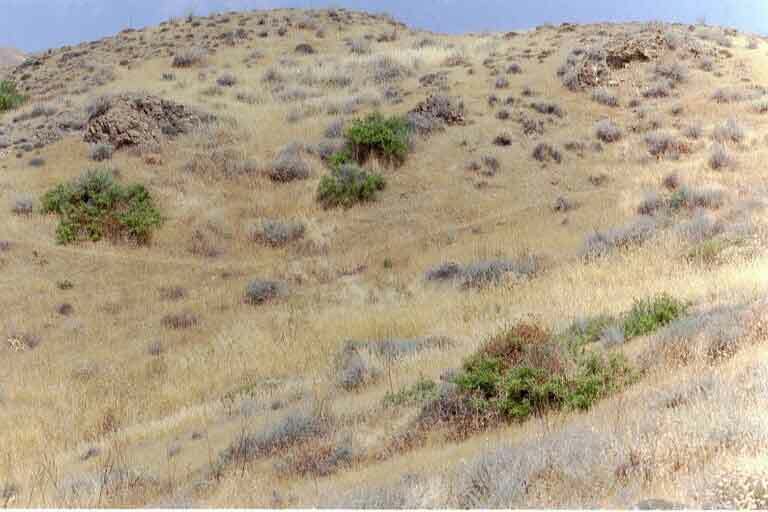 The addition of records from many more sources enabled updated versions of these maps to be published in Makris 2003 (Butterflies of Cyprus. Bank of Cyprus Cultural Foundation, Nicosia). John, E. 2004. 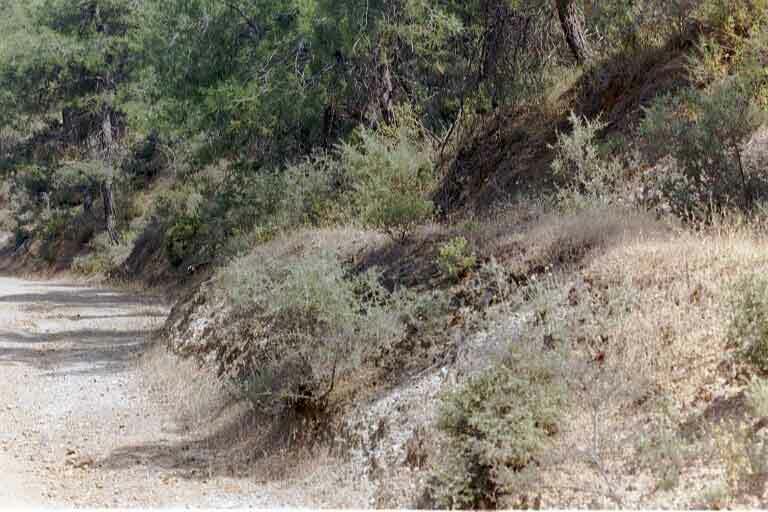 Butterfly Recording Scheme for Cyprus - a request for records. Entomologist�s Rec. J. var. Vol 116: 262. Contributing recorders are identified on the �Acknowledgements� page. To date, there are records from over 200 sources, with many people contributing on more than one occasion. Included are data derived from all, known, published records. Among these sources are the papers from Parker (1983), Manil (1990) and John (2000) - see �Bibliography� for further details. Much effort has been made to ensure that the vast majority of records date from 2000, thereby placing a minimum of reliance on older sightings. 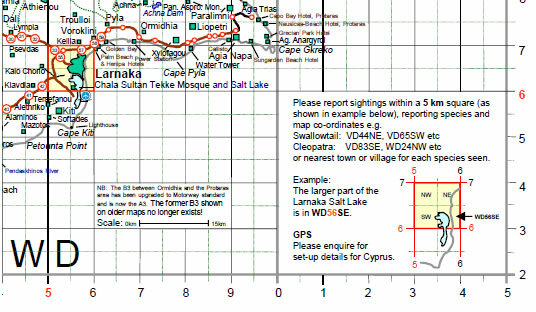 Distribution Maps used for the CYPRUS BUTTERFLY RECORDING SCHEME are based on 5 km square and 10 km square UTM grids and are updated regularly. Please refer to the �Maps� section on my News page for information on how to obtain a copy of the map produced by the Cyprus Tourism Organisation. Although the CTO maps show 5 km or 10 km grid squares, they are not clearly numbered so potential recorders may care to contact me for a copy of my own computer-prepared map to enable easy annotation of the CTO version. A portion of my map is shown below, as an illustration of the recording procedure. The selected maps show the known distribution (to Nov 2005) within the entire island for the Paphos Blue (Glaucopsyche paphos), a common endemic species, compared with the far less common but also widely distributed Eastern Baton Blue (Pseudophilotes vicrama). Whereas most of the Paphos Blue records are post-2000, the map for the less frequently recorded Eastern Baton Blue relies more heavily on slightly older data. See examples of Maps on Page 4.1. Part of my computer-prepared map showing 5 km grid UTM squares within the larger, 10 km squares. The Larnaka Salt Lake area is enlarged to show the 10 km square WD 56, within which the 5 km square WD 56SE is arrowed.